The Clean Air Act (CAA), and its amendments, provide the legal basis for federal air quality standards and regulations to be issued. In most cases, the implementation of these regulations is delegated to States and Tribes. States may further delegate implementation to counties, or air pollution control districts. The air quality regulations that pertain to pollutants emitted from wildland fire, and the sections of the CAA under which they exist, are listed below. Section 109 - The Environmental Protection Agency is required to establish National Ambient Air Quality Standards (NAAQS) limiting the ambient concentrations of certain pollutants. These pollutants include particulate matter and ozone, both can be of concern in a wildland fire context. The other criteria pollutants include carbon monoxide, sulfur dioxide, lead, and nitrogen oxides. Section 110 - States must develop State Implementation Plans (SIPs) demonstrating how they intend to attain and maintain the National Ambient Air Quality Standards. These plans cover a variety of pollution sources, including wildland fire. Section 116 - States have the right to develop and enforce more stringent air quality standards and regulations than those established by the EPA. However, States are not allowed to have less stringent standards. Section 118 - Federal Agencies must comply with air quality standards and regulations to the same degree as any non-governmental entity. Sections 160-169 - Designates certain wildernesses and national parks as mandatory Class 1 Areas. Class 1 Areas have the highest level of air quality protection with regards to additions of pollutants from new air pollution sources. Section 169A - Class 1 Areas have a national visibility goal to remedy any existing impairment of visibility that results from human induced air pollution, and to ensure that level of visibility is maintained. This goal is the basis for the Regional Haze Rule. 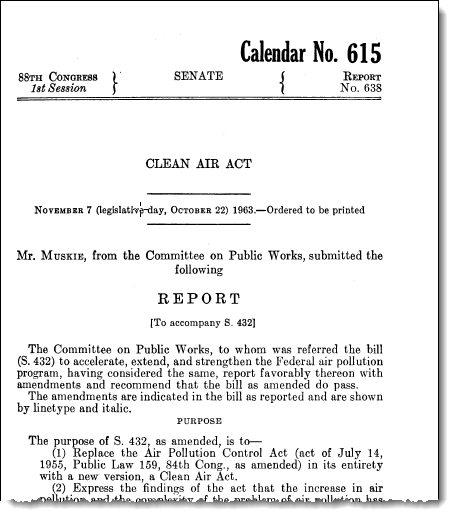 A full version of the Clean Air Act can be read at the EPA’s Clean Air Act Overview webpage.